Home » KLIA Ekspres Tickets Now Available on BusOnlineTicket.com! 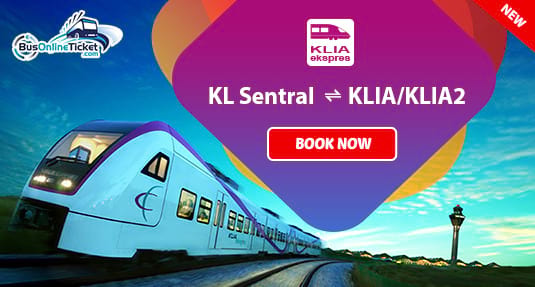 KLIA Ekspres Tickets Now Available on BusOnlineTicket.com! Only 28 minutes from KLIA and 33 minutes from KLIA2! KLIA Ekspres tickets are now available for online purchase at BusOnlineTicket.com! Now, you can check train schedule, plan your journey and easily secure your KLIA Ekspres tickets online on our website. With a 99.7% on-time performance record, passengers can also enjoy a free porter service (subject on availability), 4G WiFi and onboard Infoscreen featuring news, weather, entertainment and travel information. Another service offered by Express Rail Link Sdn Bhd is the KLIA Transit service. Compared to the KLIA Ekspres, KLIA Transit train has more stops including Salak Tinggi and Putrajaya/Cyberjaya. Hence, if you are looking for the fastest way and travel directly between KL city and the KLIA / KLIA2, KLIA Ekspres is your best option. Moreover, KLIA Ekspres service runs daily. For more details, please visit KLIA Ekspres website. Instead of going to the ticket counter, booking online makes it convenient for travelers to secure their tickets in advance before they travel. You can also book KLIA Ekspres train tickets from our mobile app that can be downloaded for free from App Store and Google Play. Book your KLIA Ekspres train tickets and the return trip online at BusOnlineTicket.com now!